A Day with Santa – and the Grinch! HomeBlogUncategorizedA Day with Santa – and the Grinch! Join KP at the City of Kennesaw’s Day with Santa, Saturday, December 1st from noon to 6pm. Santa’s arrival begins at noon with a Main Street parade featuring marching bands, decorated floats, vintage cars, and colorfully-costumed characters. The celebration continues at Depot Park with a holiday host of activities including FREE snow tubing, inflatables and amusements, kid’s crafts, visits with Santa, stage entertainment, and a holiday market full of gift ideas and unique merchandise. Food vendors will be onsite. Don’t forget to drop by the KP tent to meet the Grinch! 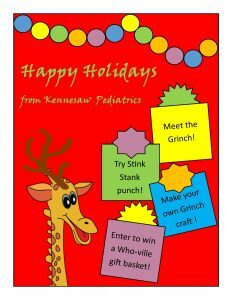 We’ll also have Stink Stank Punch, Grinch crafts and a Who-ville gift basket giveaway! For more information, click here for the event website.